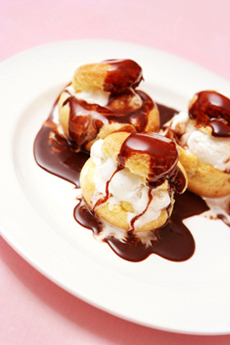 Profiteroles are pâte à choux, filled with ice cream and topped with chocolate sauce. Photo by Kevin Russ | IST. JEAN-YVES CHARON is Co-Founder and Master Pastry Chef of Galaxy Desserts in Richmond, California. CAPSULE REPORT: Pastry chef Jean-Yves Charon was born in Brittany, a region in the northwest of France. Growing up in France, Jean-Yves got to experience some of the best pastry the world has to offer. Here, he shares his knowledge of the classic French treat, pâte à choux, and provides a recipe. This is Page 1 of a two-page article. Click the black link below to visit the other page. I first learned how to make pâte à choux (cream puff pastry) as a teenager during my apprenticeship at a large local bakery called Les Geraults in Brittany, France. After making it to my chef’s approval in the bakery, I decided to share what I had learned and try out my new skills at my parents’ house. I didn’t scale back the recipe sufficiently and ended up making enough pâte à choux to last six months, and my creations were piling up in the kitchen. Luckily, one good thing with pâte à choux is that you can easily freeze it and, as long as it is well wrapped, it will last in your freezer for about six months. You can also freeze the paste and take it out and bake it as you need it. Pâte à choux (also called choux paste or cream puff paste) is a very versatile dough; numerous sweet or savory pastries can be made with it. Savory Pastry. Some examples of savory pastries are gougères (cheese pastry) and pommes dauphine (crisp potato puffs), which is a classic side dish. For appetizers filled with savory fillings, the pâte à choux can be made by substituting the milk with chicken stock or a mixture of stock and water. Sweet Pastry. Just to name a few, sweet pastries include éclairs, cream puffs, paris-brest (a baked almond-topped pastry ring filled with a praline-flavored butter cream filling, and named in honor of a bicycle race between Paris and Brest), profiteroles (small round puffs that are served cold with a sweet filling such as ice cream and sometimes a topping), Saint Honoré (named after the patron saint of pastry), and religieuse (meaning “nun” in French, this is a large cream-filled profiterole topped by a smaller one, both glazed with fondant icing; it resembles a nun, hence the name), and croque em bouche (also spelled croque en bouche and combined into one word, croquembouche). 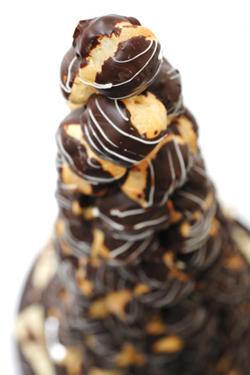 Croque em bouche is a traditional French wedding cake in the shape of a large cone, constructed of small choux puffs filled with vanilla pastry cream. The puffs are held together by caramelized sugar and finished with a web of caramel. Decorations such as candied almonds, flowers or ribbons may adorn the cone as well. The cone usually rests on a base made from nougatine, an edible mixture of caramelized sugar and sliced almonds. Croque em bouche is also traditionally served during baptisms and other special occasions. The name means “cracks in the mouth,” which is what the caramelized sugar does! in chocolate instead of caramel. Photo by Creacart | IST. For more than 20 years, Galaxy Desserts has created high-end, all-natural individual desserts including mousse cakes, cheesecakes, tarts, crèmes and pastries, in its Richmond, California headquarters. After serving for several years as the Executive Pastry Chef at Harris’ Restaurant in San Francisco, Jean-Yves Charon founded Paris Delights, which later merged with The Cheesecake Lady to form Galaxy Desserts. Previously, Jean-Yves managed production for Saralan, a cookie manufacturer in South San Francisco. In France, Jean-Yves worked as a manager for Brioche Dorée/Paris Croissant, where he opened stores in London, Paris, Canada and New York. Jean-Yves began his career at age 14 as an apprentice at Geraults Bakery in Rennes, France. His creations have graced the covers of Neiman Marcus and other specialty catalogs and have earned top honors in food circles.